It’s common to hear how homeowners are saving money when they make the switch to solar power, but what about businesses, for- and non-profits? Can a business offset their electricity bills with a solar power system? Will they see the same benefits as a homeowner when they make the switch to solar power? The short answer is yes! If you’re a non-profit and want to talk solar companies that service San Jose, give West Coast Solar a call today! 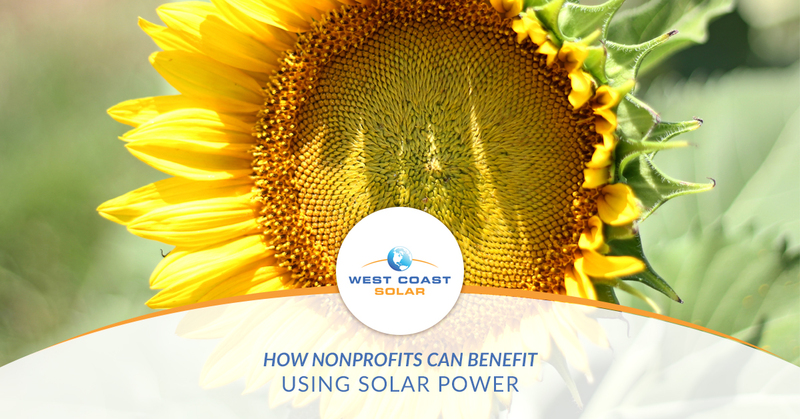 Otherwise, in this post, we’ll share three ways non-profits can benefit going solar. The money a non-profit can save on electricity expenses can be used for their mission or endeavors as a business. Although some will say that it cost too much to install a solar power system to see any immediate benefits, we kindly disagree. We’ve had businesses see returns on their systems within the first five years of installing their system. When it comes to non-profits, every penny counts toward the cause, whether that be directly or indirectly. Solar is one way to allocate cash toward the mission. When it comes to electricity rates across Northern California, a solar power system can protect non-profits from the volatile energy rates. As the energy rates continue to climb, non-profits can struggle to pay to keep the lights on. A solar power system will offer a layer of protection, since the system will produce a majority, if not all, of the companies needed electricity. Two major factors come to mind when considering a solar power system for a non-profit. The first is how it affects the economy. The second is how it affects the community. Non-profits are a business with a cause, relying on the community and humanity as a whole to join forces to accomplish a greater mission. When a non-profit makes the switch to solar power, they’re doing more than mitigating electricity costs; they’re helping the community as a whole, reducing carbon-emissions and creating a better future for everyone. Furthermore, as the demand for solar power rises, so will the need for professionals to join the industry. Jobs will be created and the economy will flourish in part to solar. As mentioned briefly above, non-profits will do more than support their cause by making the switch to solar. The environment will benefit, as well. Did you know that in 2016 the EPA estimated that U.S. Greenhouse Gas Emissions were at 11 percent for commercial and residential buildings? What’s more, electricity as a whole is estimated to be at 28 percent in 2016. A new solar power system can reduce, and in some cases, eliminate carbon emissions when it comes to electricity production and use for a business. Do you own or operate a non-profit in Northern California? It can be tough to stretch your monthly budget when you have to use 30 percent or more of it to pay for electricity. Why not make the switch to solar power? Sure, the upfront cost can be a deterrent, but consider the benefits mentioned in this post! Are you ready to find a way to go green with your electricity use? Give West Coast Solar a call today!